Several long-serving DNC members who opposed Tom Perez’s election as chair were removed from key posts on the eve of the party's Las Vegas meeting. WASHINGTON — A shake-up is underway at the Democratic National Committee as several key longtime officials have lost their posts, exposing a still-raw rift in the party and igniting anger among those in its progressive wing who see retaliation for their opposition to DNC Chairman Tom Perez. The ousters come ahead of the DNC's first meeting, in Las Vegas, Nevada, since Perez took over as chairman with a pledge this year to unite a party that had become badly divided during the brutal Bernie Sanders-Hillary Clinton 2016 primary race. 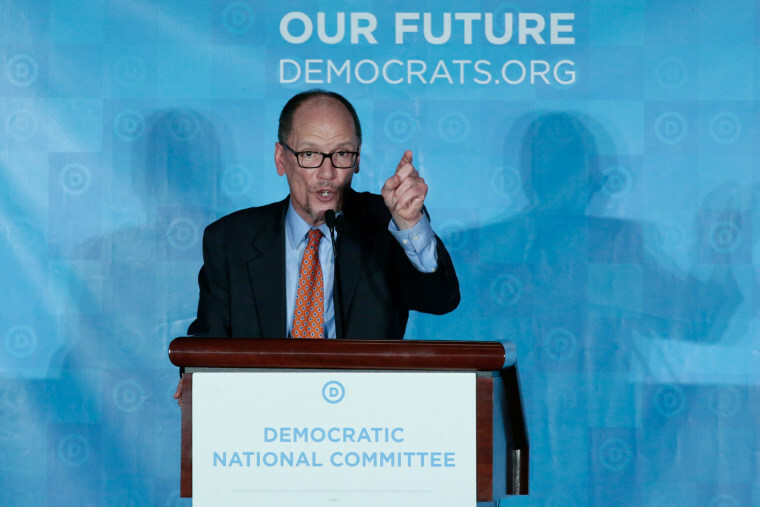 Complaints began immediately after party officials saw a list of Perez's appointments to DNC committees and his roster of 75 "at-large" members, who are chosen by the chair. The removal and demotion of a handful of veteran operatives stood out, as did what critics charge is the over-representation of Clinton-backed members on the Rules and Bylaws Committee, which helps set the terms for the party's presidential primary, though other Sanders and Ellison backers remain represented. Ray Buckley, the New Hampshire Democratic chairman and longtime DNC official who ran against Perez for chair before backing Rep. Keith Ellison, D-Minn. Buckley lost his spots on the Executive Committee and DNC Rules Committee. James Zogby, the president of the Arab American Institute and prominent Sanders backer, is no longer co-chair of the Resolutions Committee and is off the Executive Committee, a spot he has held since 2001. Alice Germond, the party’s longtime former secretary and a vocal Ellison backer, who was removed from her at-large appointment to the DNC. Barbra Casbar Siperstein, who supported Ellison and Buckley, was tossed from the Executive Committee. The moves exposed a rift in the partnership between Perez and his deputy chair, Ellison, who have publicly broadcast their "bromance" since Perez tapped Ellison for the post in a show of unity after their hard-fought race this year for the party's chairmanship. "I’m concerned about the optics, and I’m concerned about the impact," Zogby said of the changes. "I want to heal the wound of 2016." Buckley said that while he understands Perez, as chairman, can do as he pleases, "it's all just very disappointing." Germond has been on the DNC since the 1980s and was a vocal backer of Ellison for DNC chairman. "It is quite unusual for a former party officer who has been serving on the DNC for forever to just be left out in the cold without even a call from the chairman," Germond said. "So I assumed it had something to do with myself support for Keith." "I understand that I fought very hard for Keith Ellison. And I understand that to the winners go the spoils," she added. The DNC denied any retaliation, saying that the changes were an effort to diversify and freshen the party’s leadership and that all the party’s officers had a chance to offer input. They touted new additions like Marisa Richmond, a millennial black transgender activist, and the first Dreamer member, Ellie Perez, to point to the DNC's efforts at diversity. "This year's slate of at-large DNC member nominees reflects the unprecedented diversity of our party’s coalition," said DNC spokesperson Michael Tyler. "This slate doubles millennial and Native American at-large representation, provides unprecedented representation for our allies in the labor community, and increases the presence of Puerto Rican at-large members at a time when the Trump administration refuses to take responsibility for the millions of Americans who are still suffering through a major humanitarian crisis." The DNC has been under intense scrutiny from party activists since the 2016 presidential primary between Clinton and Sanders, and some had feared this week's appointments could reignite those tensions. Others worried about replacing people with years of institutional memory with inexperienced newcomers in the effort to bring in new blood. "Keith suggested names for DNC at-large membership and committees. Some were selected and some were not. In the end, the selections are the perogative of the chair," Ellison spokesperson Karthik Ganapathy said in a terse statement. Siperstein, the DNC's first transgender member, said, "I can’t speak for Tom, but you talk about diversity — I’m extremely diverse: Jewish, veteran, transgender, lesbian, grandparent, small-business owner." Despite the shake-up, Zogby, still the co-chair of the party’s Unity and Reform Commission, said: "This is a family. We’ve always operated that way."